The youngest of the national judging contests marks its third decade in 2018. 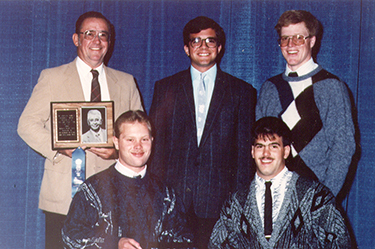 The National Post-Secondary Dairy Cattle Judging Contest began in 1989 and has been held continuously at World Dairy Expo ever since. Originating as an entirely separate contest, the post-secondary and intercollegiate contests joined forces, simultaneously judging the same classes in 2010. The post-secondary contest began with four sets of reasons, then instituted five sets in 1990. Then in 1999, the format reduced the sets of oral reasons presented back to four. In 2018, it returns to five sets. Students from 36 colleges have competed in the contest, either as an individual or on a team since its inception. Michigan State Ag Tech, Modesto Junior College, and SUNY Cobleskill are the only three programs to compete in all 29 national contests. California’s Modesto Junior College has earned nine titles and SUNY Cobleskill has won eight championships. Only five other colleges have claimed a title. Other programs participating for more than two decades include: Morrisville State College (25), Lakeshore Technical College (25), UW Madison Farm & Industry Short Course (25), and Northeast Iowa Community College (23). 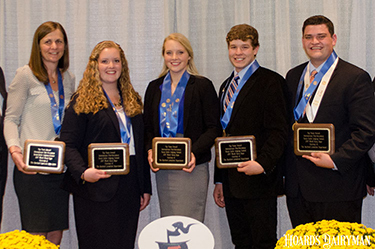 Six times in the contest’s 29-year history, the top three high individuals have all hailed from the same school. Morrisville State University did so in 1991; Santa Rosa Junior College in 1998; Modesto Junior College in 1999, 2003, and 2004; and SUNY Cobleskill in 2008. Modesto Junior College has secured the high reasons team title 10 times, Morrisville State College has seven times, and SUNY Cobleskill four times. Kaskaskia College in Illinois and Ohio State University-ATI each has a pair of high reasons team honors. Eighteen times the high reasons team also won the entire contest. In 1997, Morrisville State College had the top three reasons individuals, a feat repeated the very next year by California’s Santa Rosa Junior College. Modesto Junior College matched that trifecta in 2003, and bested it the following year with the top four reasons individuals. Only 14 times has the best talker also captured the overall high individual award. Throughout the contest’s history, the top reasons individual has hailed from SUNY Cobleskill and Modesto Junior College, both six times, and Morrisville State College five times. Michigan State-Ag Tech has had four students win the reason portion of the contest and Kaskaskia College has had two. The College of the Sequoias (CA), Northeast Iowa Community College, Ohio State University-ATI, Santa Rosa Junior College, University of Minnesota-Waseca, and the University of Wisconsin Farm & Industry Short Course each have had an individual win the coveted High Individual Reasons award. These highest average reasons scores in the post-secondary contest belongs to University of Wisconsin Farm & Industry Short Course student Mandi Puttkamer, who averaged 48.75 on four sets in 2002. In 1994, Shane Schultz of Morrisville State College and Jana McClelland in 1998 of Santa Rosa Junior College both averaged 48 points on five sets of reasons. The contest will be held tomorrow morning for 4-H, post-secondary, and university divisions. A summary of the teams competing, overall team placings, and top individuals was compiled and will be given to all attendees at the 2018 judging awards banquet on Monday evening.